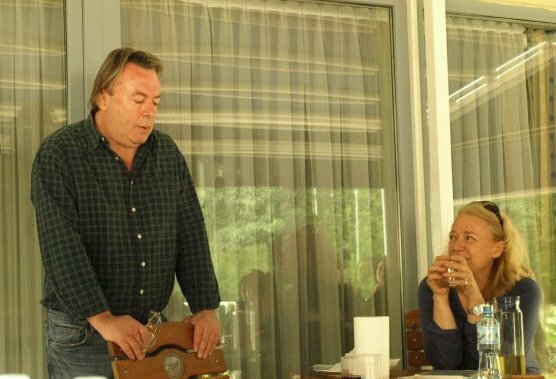 The late Christopher Hitchens had taught at The New School and several cohorts of students in the Committee on Liberal Studies had gotten to know him well. But those of us who participated in the 2009 Democracy & Diversity Summer Institute in Poland will always remember him from Wroclaw. The institute had just relocated from Krakow to Wroclaw, an old and booming city in western Poland (formerly Breslau, pre-war Germany’s second largest city) to be closer to the challenging issues of an expanding Europe. Hitchens was working on his memoirs, published a year later as “Hitch 22”, and his visit to Wroclaw was a private journey to find out more about his Jewish great-grandmother from Kepno, a small town in Lower Silesia, not far from Wroclaw. We helped him get to Kepno accompanied by the head of the Wroclaw Jewish community, and to get access to archives there. potential of borderlands in the new Europe. We were walking through the park to Centennial Hall, an impressive modernist structure where Hitchens was to give a public talk, when the news came in from Oxford that Leszek Kolakowski – a youthful Marxist, then a critic of Communism, intellectual godfather of the Solidarity movement, and one of Europe’s most distinguished thinkers – had just died. We did not know that Christopher Hitchens had studied under Kolakowski at Oxford. He quickly changed the focus of his talk, asked for a moment of silence, and spoke about the impact of developments in Eastern Europe on his generation of British leftist students. It was a magical moment, as it was at once a eulogy for his teacher, for his ancestors from Kepno, and for his youth. I wonder whether he knows that his death was reported on the first page of The New York Times. We shall miss Hitch’s brilliant mind, scathing wit, and heart.